We made it to 37 weeks! Lots of things can happen at 37 weeks! Babies can be born at 37 weeks! 1. Without going into the details, I had a rough week, pregnancy-wise. My doc took one look at me last Thursday and said, "You're done." I said, "AGREED." She said, "Go finish up your friend's wedding shower this weekend, and we'll talk next week." I go in Wednesday to see what is going on with Annabelle and consider making some plans. 2. I helped throw the aforementioned wedding shower Saturday at my house with ladies from our church for my sweet BFF/college roommate. (See belly binding post.) We had over 30 people there. The shower was so fun, she got a lot of great things, and she looked so beautiful! My house is spotless and ready for my child to come, thanks to getting it ready for that event. 3. We finished up Annabelle's room about 20 minutes before people arrived Saturday morning, thanks to some help from my mom and dad. It's lacking the blessed sheets for her big girl bed, which have been backordered from Restoration Hardware Baby & Child since the end of November. It's making me itchy, but there are bigger problems in the world. I'm living with cream colored sheets for now until the grey percale European trellis ones come in. They're probably nicer than what is on my own bed, and she will never even notice them. I should just cancel the order. Sneak peek from Instagram. As soon as I have some good light, I'll grab some with my real camera. 4. I've been having contractions. A couple of times they've gone on long enough that I pulled out my phone and started timing them, but after about an hour they taper off. Back labor. 5. I pack my bag after I get ready every morning. It's kind of wishful thinking, but it makes me happy and much less stressed out that I won't have to call Mr. G if I go into labor and ask him to pack some of my last minute items. I would put it in my car, but it's too heavy. The one thing I've asked him to remind me to pick up is my Sonicare (I forgot it last time and the cheap-o, manual toothbrush they had at the hospital did not spur me on to love and good deeds.) The most random item in my bag is a package of celebratory malted milk balls. 6. The ankles are the last to go. Last night Mr. G said, "Wow, your ankles really haven't swelled like they did with Jack's." Such the flatterer, that Mr. Gentry. Seriously? One minute later they inflated like balloons. Prayers for a safe delivery and a healthy baby girl and mama! Aw, you're almost there! Praying it will be soon, and the two of you will remain healthy! I know - big Alabama fan that you are! You can't see it in the pic, but it had a super cute red bow belt at the waist. It was SO cute, and she was glowing. She's going to look so amazing on her big day. Thanks for the well wishes! I will be watching to see if you'll be thinking pink or blue! I'm so excited for you! She will be here in no time! If it makes you feel any better I am 28 weeks and my ankles are nowhere to be found. It's highly annoying but my doctor said very "normal" with twins. I'm just praising God that it's February and not July!! I cannot wait to see all of Annabelle's room. The sneak peek is just gorgeous. 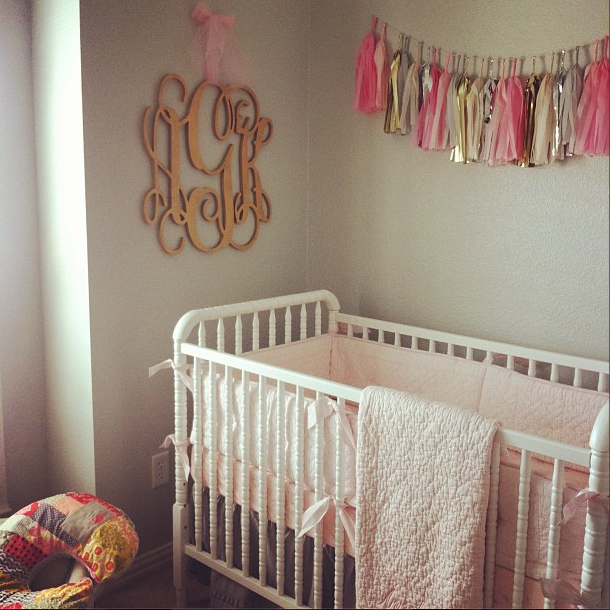 I know I told you on instagram but that crib bedding is so pretty! I love it. Hang in there...she will be in your arms before you know it! Oh, also...have you ever done a post of what you pack in your hospital bag? With you having done this before and seemingly a lot like me I would love to know what I should be packing! You need your Sonicare and I need my Clarisonic! Read: Non-negotiable. Obviously toiletries I know but what is helpful clothing wise for me and baby(ies). And what (if any) baby items do you need in the hospital? Or do they have most things you need? I am definitely going to do a post on what to pack! I've been thinking and brainstorming about it. ALLLLLLL I have is time right now, and I'm thinking of anything and everything to keep my mind off of the fact that I'm uncomfortable and so ready for her to just get here.